I thought that it was about time we had another sketch of me and I think this one turned out just purrfect! Mum achieved this work of art with the help of PicMonkey. First she went to the Comic Heroes theme and found the sketch effect on there. She then added the frame in Pixlr. Your markings make for a beautiful art effect. Cool sketch art! And Raven is right - your tabby markings are perfect for this. You guys commented on Cody's blog too early and missed the give-away link we added and we added the link to your post today. Hey being in the U.S. I gotta wait for YOU to publish to update. Hehehe.............not sure if you live in the area that they are including for the give-away but it isn't just U.S. You may want to go back to our post today! Cool art effect on your photo today ! Looks similar to the one my mom-person used for my woffie brothers :) She used Photo Scape. 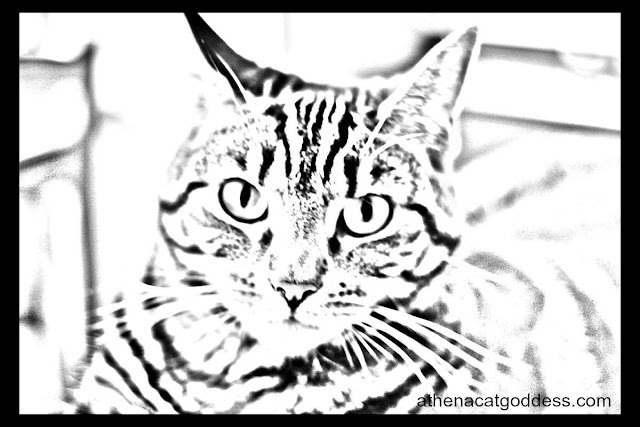 This is just the perfect effect for your stripes, Athena. They just pop out and so do your beautiful eyes! Athena I don't think I've ever seen a more beautiful sketch of you! That's a nice looking sketch of you, Miss Athena! Sketches are good examples of art. That almost looks like the photocopy filter in PS. Yous look pawsum in dat drawin' Athena. Have a gweat weekend. Wow, really like that! Happy Caturday!